Inclusion of trees in rice production at field, farm and landscape scales can improve soil health, hydrological conditions and the productivity and nutritive value of food per unit of land area, as well as contribute to income generation, and climate change adaptation and mitigation. However, trees may compete with rice, particularly for light and nutrients, thus making species choice, planting design and tree management critical for successful implementation of rice agroforestry. Selection and adoption of the right tree species by rice farmers could be hampered by lack of knowledge, skills and appropriate tree germplasm, uncertainty about returns from investing in trees, and perverse consequences of policy instruments and legislation aimed at protecting forests. Hence, these aspects urgently require scientific validation and solutions. Preliminary dialogue, initiated in Bangladesh in 2014, was followed by individual and group consultations during the 4th International Rice Congress (IRC), held in Bangkok in the same year, where crop diversification beyond just integrating cereals and legumes was discussed. Both tree and crop scientists emphasized an urgent need for continued research and up-scaling of rice agroforestry to achieve the much-needed food and nutrition security. Participants in these consultations represented IRRI, AfricaRice, ICRAF, FAO and scientists from 17 rice-growing countries including Australia, Bangladesh, Bhutan, China, Fiji, India, Indonesia, Japan, Kenya, Nepal, Philippines, Senegal, Sri Lanka, Tanzania, Thailand, USA and Vietnam. 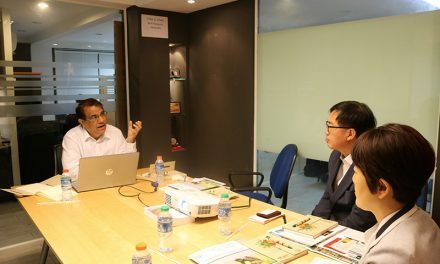 The issue was further discussed during the strategic planning workshop of the IRRI-led Global Rice Science Partnership (GRiSP) and the Africa Rice-led Sustainable Rice Intensification programmes. The World Agroforestry Centre (ICRAF) in partnership with the Regional Office for Asia and the Pacific of the Food and Agriculture Organization (FAO) published ‘Agroforestry in Rice Production Landscapes in Southeast Asia: A Practical Manual’ in 2017. In Africa, a systematic review of rice agroforestry is underway, which includes yield analysis of rice with and without trees. In India, ICRAF is planning to launch a project on intercropping of fruit trees in rice fields to increase the food and nutrition security of rural populations. In Bangladesh, fruit tree-rice system value chains are already being adopted by innovative farmers. Rice-based agroforestry has also been explored as a mitigation measure to meet NDCs (Nationally Determined Contributions) from a Peruvian perspective. ICRAF has initiated a dialogue with IRRI in South Asia, to initiate work on screening of shade-tolerant rice varieties. Bring agroforestry and rice scientists together to take stock of current knowledge and research on rice-tree combinations at field, farm and landscape scales and understand prospects for impact and constraints to adoption. Identify research and implementation priorities required to foster sustainable development and up-scaling of rice agroforestry for improved food and nutrition security, income generation, and climate change adaptation and mitigation. Develop partnerships between rice and tree scientists which could result in joint funding proposals and research.